Termites eat cellulose-based material - it's their natural food. The type of cellulose-based material they prefer, of course, is wood. In their natural state, termites eat fallen logs and stumps off the forest floor. But once they find structures made of wood, framed with wood, or with wooden inner components, they find they prefer those kinds of wood to the natural-occuring type. Termites find human dwellings and buildings offer the ideal combination of warmth, moisture and food! This means that, on your property, they can eat away the equity you have built up! Termites infest millions of homes and businesses nationwide, causing over $750 million in damage annually, according to the United States Department of Agriculture. Subterranean termites are native to every state except Alaska. A colony may include up to several million individual termites, living as deep as 20 feet underground. As is the case with many insects, each colony is "ruled" by the main brooding female, known as the Queen. 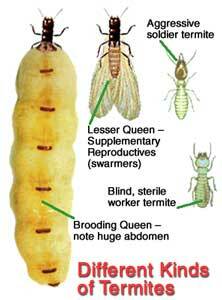 The Queen occupies a "royal cell" with the king (a Drone Termite). She may live up to 25 years, laying many thousands of eggs annually. Lesser female termites known as "Supplementary Reproductives" act as replacements for the Queen if she should die, and may also produce eggs, even if the Queen is healthy, to help increase colony size. Soldier termites, with armored heads and strong jaws, protect the colony from enemies, most commonly ants. 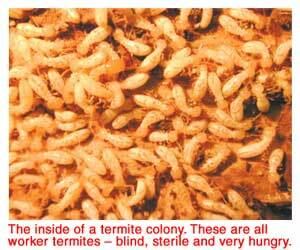 Although they look the most threatening, they do not cause the most damage - that is done by the Worker Termites. Workers represent most of the termites in a colony. Blind and sterile, they forage for the colony's food. 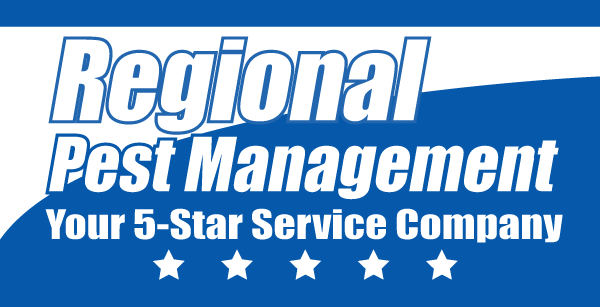 Most damage is caused by worker termites.